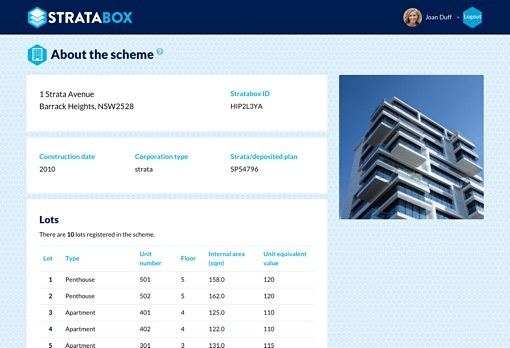 Stratabox is an easy to use solution to all your strata communication and administration needs. Entirely cloud-based, it can be accessed anytime, anywhere from your computer, tablet or mobile device. It is the first open, industry-wide solution of its kind in the world. Our web portal allows strata owners, residents and committee members to come together and run all aspects of their scheme efficiently and transparently. Its benefits will flow to professional managers and contractors alike. People come and go, your scheme's information doesn't! Residents move in and out, owners buy and sell, committees are renewed yearly, and professional manager's contracts are limited to 3 years. Regardless of these constant changes, Stratabox will provide you with absolute data continuity for years to come. All-in-one, integrated Strata roll and 2-way communication tool. Users can send and receive information to relevant audiences, online or straight from their email. They can customise their level of involvement in every aspect of their scheme by choosing to receive information immediately, daily or not at all. As hard as we try, we can't think of everything! That's why we make it our priority to listen to our users and explore all suggestions we receive to make our solution as comprehensive as possible. If you need it, we'll build it! State of the art needn't be complex! Stratabox combines a fresh user interface, advanced functionalities and email integration to ensure everyone can interact, from anywhere. Its custom setup allows very different buildings to access only what they need to keep it simple. We constantly monitor performance and refine the site to ensure the best possible user experience. Your data is kept secure with bank grade encryption and regular backups. Report, track and resolve issues quickly and efficiently. Stop playing phone tag or sending emails on a wing and a prayer! 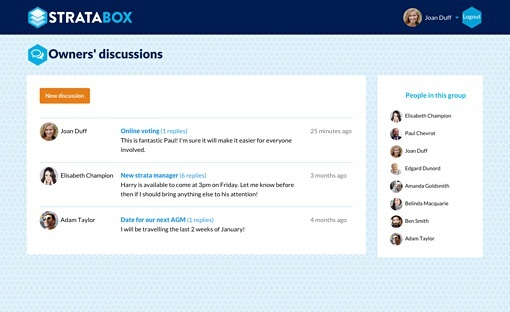 With Stratabox, all issues are logged and can be tracked until they are resolved. Save time, reduce aggravation and increase satisfaction. 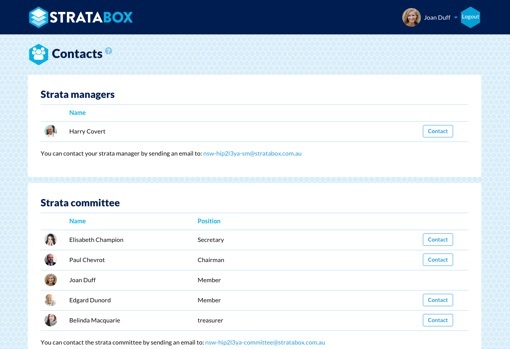 With email integration and a mobile-friendly user interface, you can access Stratabox from anywhere.